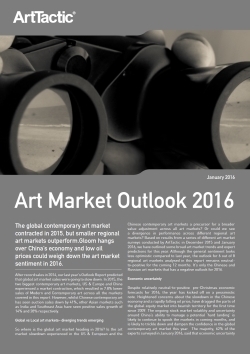 This is the 8th edition of ArtTactic’s annual Global Art Market Outlook. The report looks at international auction trends for modern and contemporary art between 2010 – 2016. 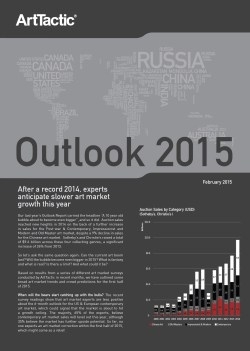 It also includes predictions and forecasts for where the global art market might be heading in the next 12 months. It was a challenging year for the global contemporary art market in 2016. Bellwether sales in post-war and contemporary art in New York and London were down 32.7%. However, despite a fall in auction sales across 8 out of 10 regional markets, there are signs that the market bottomed out in 2016. Although a market rebound in 2017 might be too optimistic, a consolidation around current levels would instil confidence and stability to the market. Art market recovers in second half of 2016: Christie’s reported a 29% decrease in auction sales, while Sotheby’s saw a 31% decline in sales for the first 6 months of 2016. Despite the negative trend for the year, there were signs that overall sales by Christie’s, Sotheby’s and Phillips improved during 4th quarter last year, with sales down 25.1% compared to the same period in 2015. 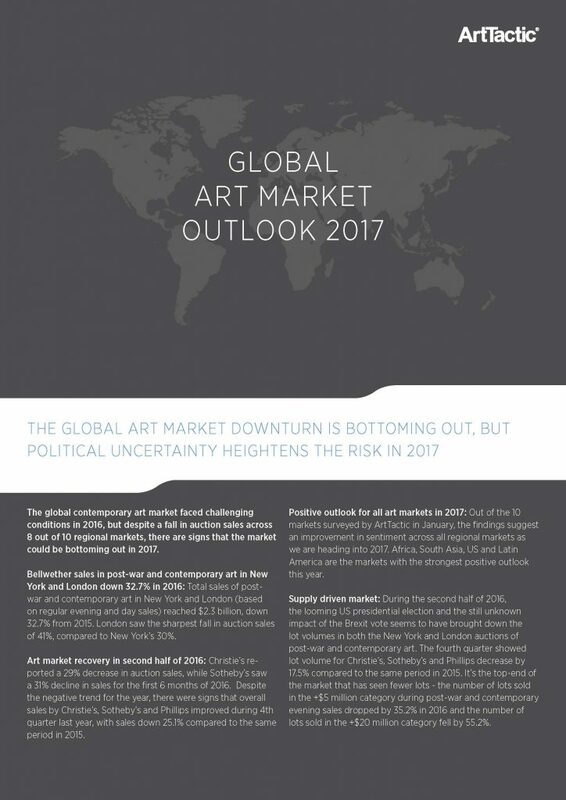 Positive outlook for all art markets in 2017: Out of the 10 markets surveyed by ArtTactic in January, the findings suggest an improvement in sentiment across all regional markets as we are heading into 2017. 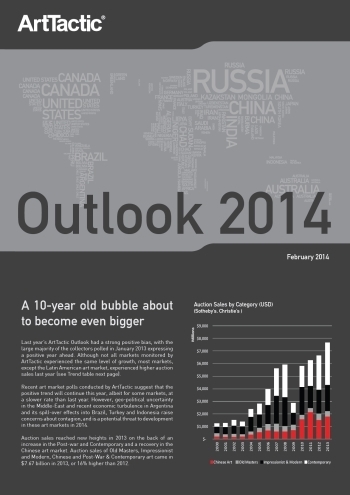 Africa, South Asia, US and Latin America are the markets with the strongest positive outlook this year. Political uncertainty the main risk to the art market: The recent ArtTactic expert survey ranks ‘Political uncertainty’ the biggest risk to the global contemporary art market in 2017. With the advent of Brexit and the outcome of the US election, a new level of political and economic uncertainty is likely to dominate the world in 2017.